This OCP report has been prepared to fulfill the requirement for getting MBA degree. This report is the outcome of my internship in Qubee Bangladesh Ltd. on the above stated date. 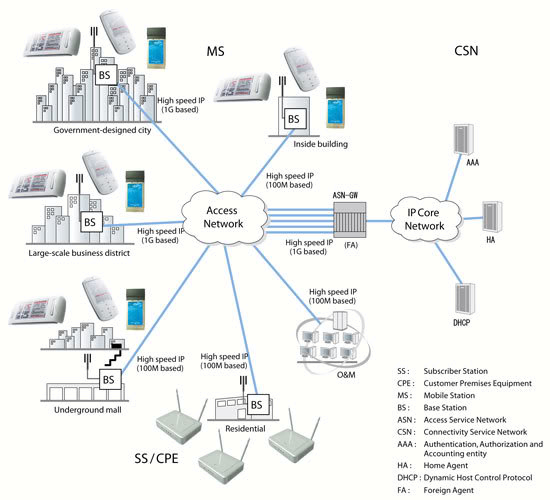 My OCP report is based on the “Qubee internet service provider- operations in Bangladesh”. The internet is one of the most liberating, exciting features of life in the 21st century. Whatever you’re into – music, news, views, video, information, chat and contact, research, for business, pleasure or education – we think you should be able to enjoy uninterrupted access to it, wherever you are, whenever you want. The main focuses of this report are sales and distributions of Qubee internet service for different classes of people with different packages and to demonstrate different aspects of marketing in the organization. My OCP report is an educational requirement of MBA Program under an assigned faculty International Islamic University Chittagong, Dhaka campus which is a professional degree. MBA students have to do an OCP report as a practical orientation to the workplace where he/she can amalgamate the traditional hypothetical knowledge. I have completed my MBA from International Islamic University Chittagong with major in Finance & Banking. To present the overview of the operation QUBEE in Bangladesh. To observe the activities of Sales & Distribution Department of QUBEE. To demonstrate different aspects of marketing in the organization. To find out the operational function of QUBEE’s different sales centers. To analyze the customer satisfaction of wimax internet Service by QUBEE. To compare sales and distribution between wimax internet service and dial up internet service. The data needed to prepare this report has been collected from secondary sources. The secondary data have been collected through QUBEE’s official website, Aamra group’s official website and others website related to report topic. OCP report is one kind of research work. Research work requires enormous time and effort. But the time provide to us is not enough to do the report. Moreover mine was on job training rather than Internship. It’s prohibited to disclose some information. This affects the quality of the report. Lack of experience of this type project is one of the main constraints of the study. Qubee is a new and exciting company from Augere providing fast and reliable broadband internet services to residential and business customers across Bangladesh. Qubee is the creation of a group of global telecoms professionals who saw that a new technology called WiMAX could really change the internet experience for millions of people worldwide. WiMAX means that you don’t need telephone lines or cable to get connected: all you need is to live close enough to a transmitter to receive the internet wirelessly. Augere was established in September 2007 by an experienced team of global telecoms executives with the vision of delivering ‘broadband for all’. It is omitted to achieving this through the delivery of fast, reliable broadband internet services in emerging markets using Wimax technology. Augere has an established leadership team in place with over 150 years’ experience in the telecommunications industry. The Company successfully raised $125m in a first round of investment from France Telecom, New Silk Route and Vedanta. The acquisition of spectrum and licenses is well underway. Augere currently has access to spectrum in Pakistan, Bangladesh and Uganda. Licenses are also being actively pursued in countries across Africa, South and South East Asia. Augere’s first commercial network launched in Pakistan in July 2009 and was closely followed by the Bangladesh network in October 2009 under the brand name QUBEE. QUBEE believes that everyone should be able to enjoy trouble-free access to the internet and the world of opportunities that it brings. The company’s aim is to make a magical internet experience available to everyone, every day, without exception. Qubee is the creation of a group of global telecoms professionals who saw that a new technology called WiMAX could really change the internet experience for millions of people worldwide. WiMAX means that you don’t need telephone lines or cable to get connected: all you need is to live close enough to a transmitter to receive the internet wirelessly. Currently the company is busy building a network of base stations to offer their brand of internet access right across Bangladesh. Initially QUBEE is starting in Dhaka, but quickly plan to do the same in cities nationwide. To build a network like this needs to be done properly. So the company gathered a highly talented team right here in Bangladesh to build a company that’s determined to improve the internet experience for millions of people – not just here, but ultimately all over the world. The internet is one of the most liberating, exciting features of life in the 21st century. Whatever you’re into – music, news, views, video, information, chat, and contact, research, for business, pleasure or education – we think you should be able to enjoy uninterrupted access to it, wherever you are, whenever you want. We are just not making the internet work; we’re making it work beautifully. And now it can be yours to enjoy. • Qubee is the real wireless broadband internet from Augere, an MNC incorporated in Netherlands. • Qubee is the name of a commitment for high speed and uninterrupted internet experience for users in Bangladesh. • Qubee provides its service through WiMAX technology. • It must be Magical: It’s not about magic, it’s about being magical. It’s about us bringing delightful touches to the customer experience. • It must Work: It’s not about troubling people with complicated solutions. It’s about our hard work making it reliable and accessible for people. • Qubee offer Fixed WiMAX service for Home & Business (SME) use. • Qubee product is differentiated by Speed (256 Kbps, 512 Kbps, 1 Mbps, 2 Mbps etc.). • User Name & Password stored in Modem and connection “Always On”. • Any PC Connected to devise will be on Internet without extra Authentication. • You can share the bandwidth among multiple PCs using a Router or LAN. Just provide our Installation Engineer your router/ Switch LAN cable. We are happy to provide you the installation service. QUBEE is a new company in Bangladesh and its still recruiting. Currently it has 110 employees (both permanent and contractual). The internet has become an essential part of everyday life in the developed world. However, the ‘World Wide Web’ is a misleading term. The internet has only a fledgling presence in developing nations. Internet usage, as a percentage of the population in countries such as Morocco, Russia, India, Indonesia, Pakistan and Nigeria ranges between 4 to 24%, well below the levels of developed countries. From a social perspective, there is an intrinsic link between education and the web. The benefits of investing in digital connectivity and promoting access in schools and universities are clear. Accessible • Customers can access top-up facilities within a convenient distance of the places where they live and work. QUBEE believes that delivering the above is achievable by developing strong local partnerships and building local companies with empowered local management. Administration and Human Resource: As the name implies, this department has three major divisions. The Administration division is responsible for Contract, Legal and Protocol & Government affairs. The Purchase & General Maintenances is responsible for Purchase & Support and Estate & Properties, Maintenance & general security. The Human Resource department is responsible for procuring future employees according. This department is also responsible for maintaining the database of all employees, leaves, attendance, health care and related fields of employees. Although Qubee is a new company with a small group of employees but they are keen to manage their employees through HR practice. Qubee has the 4 layer distribution of employees. Currently they have 130 enthusiastic employees to operate their company. The head of the company is CEO and under him they have functional managers who are senior managers, managers, assistant managers. Respectively senior executive’s and executive’s works under the functional managers. Though these 4 layer human resource distributions Qubee create synergy between their employees and make their collective effort much more effective. For recruitment employees Qubee is using EN ROUTE recruitment agency and other some recruitment agencies to get efficient employees. Qubee marketing team is working nicely. Marketing department has three sub departments. These are…. This department is responsible for find out the innovative features that can attract the existing and potential customers. Product development is one of the key departments in the company. While developing new packages and tariff plans this department has to keep in mind the profit and cost issue. Under all these constraints the department has been producing exciting and new features which ultimately attract customers .Product team always tries to come up with different types of products by considering peoples need and wants. Product teams introduce Gigaset, Dongle, for the customers. Gigaset has the power to capture the frequency more compare to Dongle. So Qubee provide Gigaset where frequency is bit poor and Dongle for people who want mobility. Product team design their product according to the customer wants. The brand department of the company deals with image of the brand to the customers. It basically helps the brand to portray its intentioned image to the potential target group. This department along with the Marketing Communication department deals with the promotional activities. As Qubee is very new organization and WiMax is a very new concept that’s why Qubee have to give too much effort and promotional activities to let the people know about their product and services. Branding is another sub-department of marketing. Branding team is trying to promote their qubee product. They have organized different events to promote their product. At first they do a campaign in different universities, which worked a lot. At present they are not branding their product extensively but they have a plan for extensive branding. Qubee is now giving advertises to different renowned news papers in Bangladesh and they are also giving advertisement to the different website to promote their product. They also giving advertisement in the Radio like Radio Amar, Radio Foorti etc. 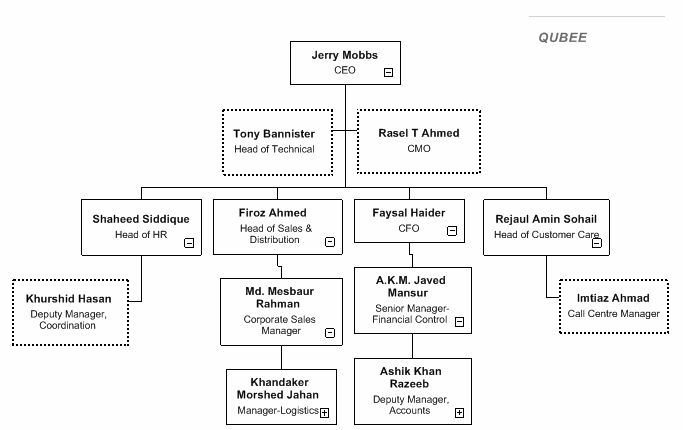 Qubee sales and distribution team has five sub departments. These are….. Direct sales team handles the home users and SME. They try to make the product available to the corporate and single or home users. In Dhaka city there is more than 50,000 SME. So Qubee targeted those SME and the direct sales team works with those organizations. Corporate Sales team works with the corporate clients. Some renowned companies are our corporate clients. They are……. 4. World Bank and so on. good long term goodwill with such corporate clients. This department however deals mainly with sales to corporate customers and maintenance of relations with both current clients as well as scouting out potential new corporate clients, whereas the after sales service and other issues are dealt with by the customer services operations section of the company. Distributor makes sure that qubee product is available in the market. They get commission on modem and bandwidth price. Tele sales team sale qubee connection by making call to the potential customers. They have some customer group from the business corporate world. For selling to those people they adopt telemarketing approach Qubee is distributing their product through their own outlet and third party. They have their own outlet in Gulshan 2 at Casablanka Store and they are using Transcom as third party to distribute their product. They have also given exclusive right to some computer accessories selling company which are located in IDB to distribute their product. give the practical experience to their subscribers and they have highly focused on that Experience booth to promote their product. It is now possible to try out the real internet experience from Qubee at your favorite coffee shop or shopping mall. 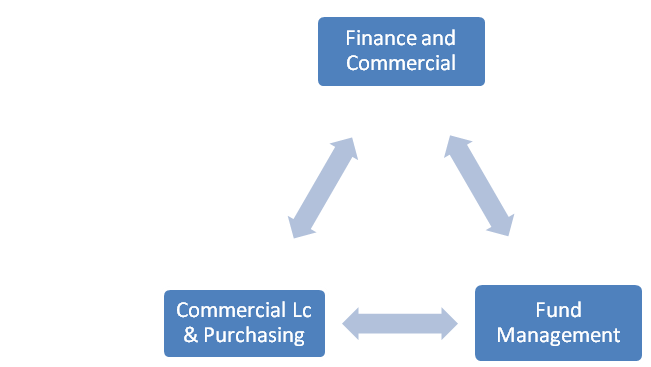 This department is divided into two divisions, a) LC preparation and Purchase, and b) Fund Management. Here LC is opened for purchasing of modems and equipment, and all the funds collected are used and controlled for the maximum benefit of the company. This department is also responsible for the budgeting which takes place once a year for the next three years. Qubee just started their operation from October 09. They are new in this emerging industry. So initially they are not going to give equal focus to every aspect of the business. For their business Qubee initially want to give focus to two most important activities. One is “expansion of coverage” and other one is to improve their “own process of service”. 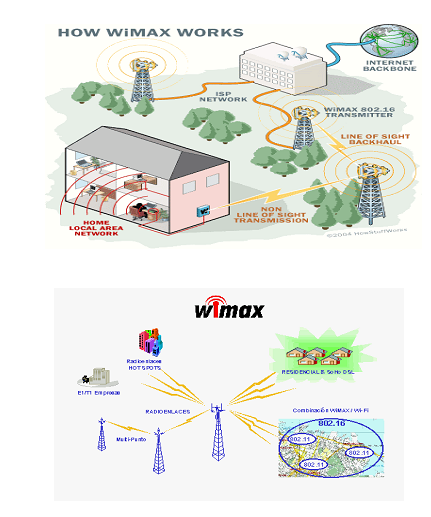 Wimax is a network based internet solution to everyone. For that they need to expand their coverage all over the Bangladesh to provide their service to targeted customer. 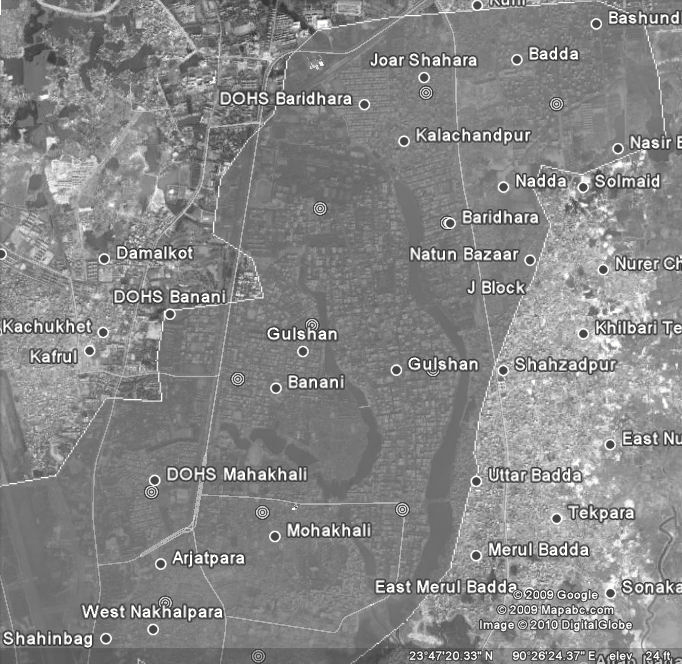 Initially they are expanding their coverage in the capital Dhaka. Already Seventy five percent of the Dhaka city is under their network coverage. They are aiming to cover 6 divisional cities within one year. And want to serve the whole Bangladesh with their network coverage within three years. They are aggressively expanding their network coverage. For that they are sharing and hiring other telecommunications network infrastructures along with their own infrastructures to expand rapid network coverage. Now on they have hired Banglalink, Grameen phone and City cell’s network to expand their network. Internet service is all about how speed you can provide to your customers. Capability to provide high speedy wireless internet to customers is the main core competency of Qubee. Superior 24/7 customer service and greater network coverage are playing a vital role as their core competencies. At present they are providing their service in Dhaka city, in these five polygons. Qubee target was, at the end of the May they will have full Dhaka city coverage and at the same time they will start their operations in Chittagong. They have kept their promise. Price is the only revenue generating element of the marketing mix. So for any organization determine the price of the product plays a major role of success. As WiMax is totally a new concept in Bangladesh both Qubee and Bangla Lion should determine the price of their product very sensitively. As Qubee first introduce wimax in Bangladesh they took the first mover advantage. They followed the price skimming strategy to enter into the market. The practice of ‘price skimming’ involves charging a relatively high price for a short time where a new, innovative, or much-improved product is launched onto a market. The objective behind choosing skimming strategy is to “skim” off customers who are willing to pay more to have the product sooner. On the other hand when a new company comes to a new market they have to bear a large amount of pioneering cost. That is why in this situation they always try to charge high price for their product. Also when they are determining the price for their product they bound to follow the rules of price ceiling that is set by the BTRC. QUBEE has exceptional expertise in the design, roll-out and delivery of telecoms networks in emerging markets. QUBEE’s strategy is to identify emerging market opportunities. QUBEE’s selection criteria is based around sound business planning principles which identify markets based on a number of key success defining factors such as population (and urban density), literacy levels and GDP. 3.1.2 Availability and access to spectrum. Each country has a unique process for the allocation and pricing of its spectrum. QUBEE has a robust methodology for assessing the ultimate value of the spectrum. 3.1.3 Ability to rapidly ‘operational’ in country. Technology roll-out and integration, coupled with intensive training on the ground allows QUBEE to quickly bring its services to market. 3.1.4 Deliver affordable and reliable broadband. Use economies of scale and superior technology to achieve a customer proposition of affordable and reliable broadband. On-going pursuit of opportunities for geographical expansion. Carry out spectrum acquisition and network rollout in several territories. WiMAX service providers, so Qubee has to set the price within that price range. v Value Based pricing: Qubee is following value based pricing. They consider the purchasing power of their customers while deciding the price range. However they evaluate the speed and maximum access which can be provided by them within that range and fix the price for every segment. v Product line pricing: product line pricing is different price for different range, or different service offered, their connections are shared connection, different package like sky and campus have different price, as sky has no access limitation so it’s a bit higher in price, and for campus speed and access limitation has cap on it so the price varies. v Currently for promotion and popularity they are offering free installation for every connection they provide. A modem (modulator-demodulator) is a device that modulates an analog carrier signal to encode digital information, and also demodulates such a carrier signal to decode the transmitted information. 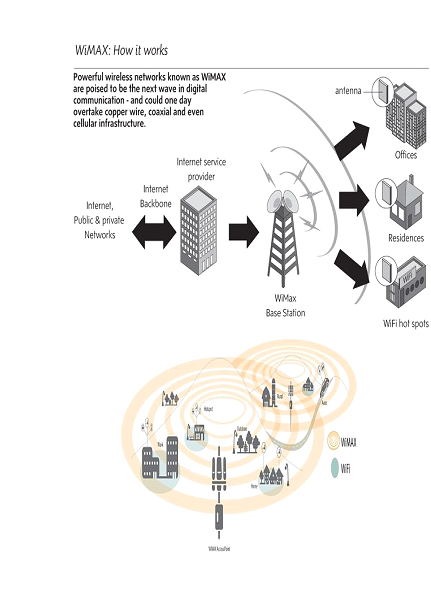 The goal is to produce a signal that can be transmitted easily and decoded to reproduce the original digital data. Wireless modems can be embedded inside a laptop or appliance or external to it. External wireless modems are connecting cards, USB modems for mobile broadband and cellular routers. Whether you want speed, value or volume: the New QUBEE pre pay has it all. QUBEE has 3 scratch cards of Tk 700, 400 and 100 @ QUBEE retails near you, so just grab your card, choose your package by calling 02 895 99 11 and start using it the way you want. Qubee has introduced the Qubee Campus package, starting at 850 Taka/month (excluding VAT) for a 128 kbps download speed. Only students can sign-up for the Qubee Campus package. During, sign-up students need to bring their school/college/university ID to sign up for the service. Although the 128 kbps Campus package has unlimited downloads, Qubee’s fair usage policy still applies. The higher-tier 256 kbps Campus package is priced at the same 850 Taka/month but with a 5 GB monthly download limit. Installation charge is the same at Tk 4,000. To restrict users from using up too much bandwidth (Qubee and also Banglalion) restrict the amount users can download continuously. You can download straight for 4 days (provided you keep the PC on all the time) and on the 5th day Qubee will start tracking your usage. They may decide to cap your download speeds or charge extra for the usage. To be on the safe side, take a break after every 3 days. The fair usage policy does not apply for packages that have download restrictions (e.g. 5GB for Qubee’s 256 kbps Campus connection). If you exceed your limit, Qubee will charge you an additional 0.10 Taka for every MB you download. 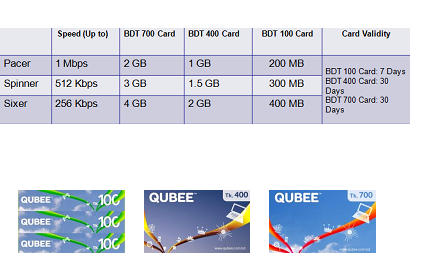 QUBEE now offers mini pack @ only BDT 500 (including VAT) with 256 Kbps speed and 3 GB usage limit. Grab your mini pack with the new QUBEE Dongle only @ BDT 1000. QUBEE gives you more reasons to play and discover the world of Internet. QUBEE introduces a new High volume pack of 24 GB starts @ 1150 BDT. Choose your desired monthly plan and start discovering the world of internet. *All packages are in BDT. Additional charge of BDT 0.15/MB beyond Usage Allowance is applicable in all packages except Sky. Figures in above table indicate monthly fee. For every monthly package you will get total BDT 1000 off in your 3 months package fee. WiMAX service provider Qubee has doubled its internet speed to provide the fastest wireless internet service to its customers without any extra cost. “This means 256 Kbps users can now enjoy up to 512 Kbps; 512 Kbps users will experience up to 1 Mbps and 1 Mbps users will enjoy up to 2 Mbps without paying any extra charges.”The company introduced the broadband “Pre Pay” services in the country for the first time and offered modems at Tk 1,000.Customers can now avail up to 1Mbps speed through Qubee Pre Pay by paying Tk 400 a month. Dial up connection: people dial the phone no. and then connect to internet provider but dial up is running very slow speed. Broadband: people direct connect to internet provider just login the password and username, people have the more option to select your high speed. Normally Dial up has only 56 KBPS speed and broad band has faster speed like in 2 MBPS. Dial-up connection is the one where people need only internally fixed modem and it connected via telephone line. Its a package which is prepaid they will give a card according to interest of package and will give the Administration id and password, where people can dial-up each time via phone line, and the phone line will be off while u r in the internet. Where as in broadband, they will provide an external modem and will give connection via cable (fiber optic) where people can use at any time without disturbing phone connection, both works simultaneously. Even they have various packages both in prepaid and postpaid options. Dial-up Internet Access is a form of Internet access via telephone lines. The user’s computer or router uses an attached modem connected to a telephone line to dial into an Internet service provider’s (ISP) node to establish a modem-to-modem link, which is then used to route Internet Protocol packets between the user’s equipment and hosts on the Internet. Broadband internet access, often shortened to just broadband, is high-speed Internet access—typically contrasted with dial-up access over a modem. A broadband connection is a lot faster and it’s always connected to the internet via a modem. But a dial up connection has to be dialed every time in order to get access to the internet. It uses your house phone line as the modem which means that if people try and phone your landline when you are using the internet they will not be able to get through. The office of the Senior Vice President of Sales and Marketing Division is responsible for coordination of marketing activities across the company and to provide top level management with an overall picture of the market situation. The Vice-President of the division oversees the product and business development scenario of the company and he is responsible to the SVP of the division. He is heading the Sales Division so he has to control all the Sales channels as well. The assistant vice president responsible for channel management has the very important job of setting up marketing channels by which packages are distributed among clients and by which feedback is obtained from customers. This department is responsible for the selection of new dealers and motivating them and current dealers to promote QUBEE packages to their customers in their respective areas. These departments is also responsible for seeing that there is an excellent support network for each dealer and that they are satisfied with their monetary or otherwise remunerate action. This department is also responsible for checking that each dealer does not cut into the sales of another dealer in a very proximal region. The chief responsibility of this department is logically, promotion and communication of new products and product ideas to customers both directly through selection of advertising media, then dissemination of information by means of advertisements; and indirectly through dealers by providing them with promotional material. This department is also responsible for public relations which do not include corporate relations. This is handled, as we have seen, by other departments. The responsibility of this department is immensely important especially in the introduction stage of a package for customers. They also provide help for other departments such as the front office and services marketing in order to promote QUBEE packages to both current and new customers. This helps very much in handling cases of dissatisfied customers and also in case of adjusting customers with old packages who have to be convinced to upgrade their packages to the new ones on offer. The company sub-contracts its promotional materials production to local companies. A regular number of events are held to integrate promotional activities with public relation exercises to enhance the image of QUBEE and better promote the packages on offer. This is a unique department with a very specific job description. This is to educate the new customers with the WiMAX technology through various Experience booths throughout the Dhaka city. This whole dept. is being run by a third party, Asiatic Sales Team. The manager of Activation control and assign the sales persons of Activation team and promote the product and sell at the same time. This particular department looks after the Free Trial Users who got the connectivity as a complementary gift from the QUBEE. This department also arrange drive test on various locations and provide 1 months free connections if necessary. 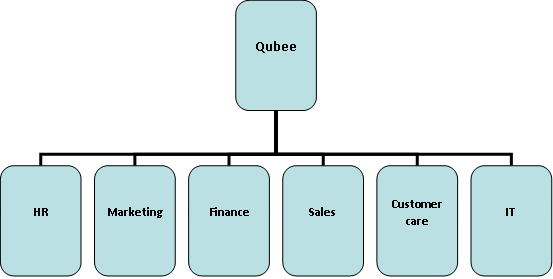 The overall structure of the sales & marketing department and its sections of QUBEE have both advantages and disadvantages in terms of organizational structural and respective functionality. Most importantly, QUBEE is a new company and it has a long way to go. So, over the time, we can expect QUBEE to flourish itself in the ISP arena. As the employee gets the above motivations from the organization so employees always try to put hundred percent efforts to their job. This increases the productivity of the organization. We are a broadband internet service provider dedicated to providing a fast and reliable internet service to residential and soon to business customers in Dhaka and then across Bangladesh. ü Where can people find out more about Qubee? We hope that all the information people need can be found on this website. If there’s anything you think we’ve forgotten, we’d love to hear from people. Please call our customer service and support line on 02 895 99 11. We’re here 24/7. People can also visit us at one of our Qubee Points (10:00 hrs – 19:30 hrs) or at a Qubee experience booth. ü How can people get Qubee? We’d love people to join us so we’ve tried to make the process as straightforward as possible. Completing this form will prompt a sales representative to get in touch that will take people through the rest of the registration process and ensure the connection is installed as quickly as possible. ü Which services does Qubee offer? Qubee offers a fast and reliable broadband internet service with packages available to suit a range of speed and download requirements. ü Is Qubee suitable for use at business? It most certainly is and we’d be very pleased to offer advice about using Qubee in the workplace. Just call our customer service and support line for more information. ü Is Qubee available in whole area? Qubee is currently available in Dhaka and Chittagong. But please keep checking as the Qubee network is growing all the time. We also have plans to expand into other cities. ü Is a Qubee connection more reliable than cable or dial-up? We use WiMAX technology which means that people receive our internet service wirelessly. We don’t have to rely on infrastructure which could become old and corroded. This allows us to provide a faster, more reliable service. ü What packages does Qubee offer? Qubee currently offers three high speed packages, with more packages coming soon. We hope there is something to suit every internet user. ü What kinds of data speed can people expect? Qubee provides broadband connectivity at 256Kbps, 512kbps or 1Mbps. Check out what a difference more download speed can make here . ü How do Qubee speeds compare to DSL, cable and dial-up? We offer services at a range of speeds with the fastest service at 1Mbps. We hope people’ll be happy to find that the speed pay for is the speed people get. ü Which operating systems and devices does Qubee support? Qubee can be used with most computers and commonly used operating systems. ü How do people access the internet with Qubee? Once our engineer has installed your Qubee modem, people’ll be able to access the internet anytime by simply logging onto your computer as normal. ü What can people do with 1GB? 1GB is a surprisingly large amount of data. People can stream around 19 hours of MP3 music or watch 7 hours of You Tube video or send 13,000 emails with small photo attachments. ü What methods of payment are accepted? We’re very happy to accept cash and credit cards at any Qubee outlet. People can also deposit payment at selected branches of The City Bank on the Qubee deposit slips available in branch. Visit our Bill Payment page for all locations. Please do not forget to include Qubee account number on the deposit slip. ü Does Qubee charge to visit premises? Qubee will provide complimentary installation of modem and up to one visit to premises every month free of charge. Any additional visits will be charged via monthly invoice at BDT 200 per visit. ü How do people receive my bill? People’s bill will be sent monthly to the address provided on subscription form. ü How long will it take to set up connection? Once anyone has signed up, we’ll make an appointment with him/her for an engineer to come out and install your equipment. We offer four hour windows for appointments and installation will normally take place within 3 days. Our engineer should take about an hour to set up the equipment. ü Can people install the equipment themselves? We are very pleased to offer free installation by our trained installation engineers. This will ensure that people receive the best possible Qubee service. ü Can upgrade package if anyone wants more bandwidth? Yes. Please contact our customer care line. Our agents will be happy to advise people. ü Can people I use my existing modem to access Qubee? 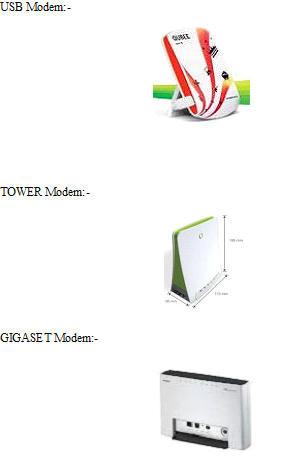 No, people will need a dedicated Qubee modem. ü Can people connect more than one computer to the Qubee service? Yes people can, providing that you have your own WiFi router or LAN. People will need to set up and maintain own WiFi or LAN environment. ü What is Qubee’s policy on P2P (Peer to Peer)? We require that all our subscribers behave within the law. Customers on a post pay service are also asked to respect the fair usage download limit as defined in our terms and conditions. ü How secure is the connection? WiMAX is an inherently secure technology with encryption and authentication performed automatically. It’s still important that internet users make sure that their own computers have anti-virus software installed and that user’s only visit sites and download emails from trusted sources. ü How do people manage my own account? Soon people will be able to log in and manage Qubee account online. In the meantime please contact our customer care team if people require any assistance. Go to Advanced Settings>WiMax configuration. Re-type your password and hit OK.
Go to Administration>Restart and click OK to reboot your device. It usually takes a minute to reboot. v QUBEE is trying to grab the ISP market of Bangladesh in both home user end and corporate clients. v QUBEE’s main competitors are Telecom operators, existing ISP companies and local providers. QUBEE’s competitive advantage is having the wireless broadband technology or WiMAX. v The competitive advantage for QUBEE is having Aamra Networks as their local partner (shareholder). Aamra Networks is the leading Corporate ISP in Bangladesh and they have a very good reputation in this sector. v To cope up with this changing business environment in Bangladesh, the government decided to allow private entrepreneurs to act as ISPs using VSATs (Very Small Aperture Terminal) in 1996. In 1999, there were about 22,000 account holders with 10 ISPs (8 in Dhaka and 2 in Chittagong) and the total number of users ranges around 100,000, while in 2000, there are about 100 ISPs providing Internet services to more than 250,000 Internet home users. v More than 100000 people used Internet from cyber café. The growing demand of the society and the congenial global atmosphere towards Internet has pressurized the entrepreneurs to re-think their policies and strategies to accommodate the newly emerged rapidly enlarging target group. v The optical fiber has already introduced in Bangladesh which makes our communication faster and cheaper. This will also change the business environment. WiMAX is also introduced in Bangladesh. QUBEE and Banglalion have got the license and QUBEE has started their operation already. v QUBEE’s motto is to provide access to internet for everyone. From middle to upper class people are fond of leading a modern life because it makes the life faster, speedy, complicated and efficient. We can hope, through WiMAX, Bangladesh can achieve sustainable growth in the near future. v QUBEE provides monthly usage limit (set around 20GB) for the 1 Mbps package but the lower packages (256 and 512 kbps Sky) does not have this limit. After going through the above project work over QUBEE we found, QUBEE is trying to grab all the opportunities to be successful in Bangladesh Broadband Market. But considering Bangladeshi consumers, we would like to draw their attention over some of the following facts. v Brand name should be easy to understand and communicate. But QUBEE is a Latin American word which means Head, works without wire. It’s really appropriate for Broadband service. But for Bangladeshi consumers may not accept it properly. We have several examples in telecommunication industry that became successful by adoption local names (Like: Orascom as Banglalink, Telenor as Grameenphone) and some companies failed (Like: WARID with ZEM and ZAHI packages) to continue business for their foreign name. v QUBEE could offer more product packages with variable features to compete the other broadband companies. Like: Banglalion has more product variation than QUBEE. More product variation helps a company to be unique. Even it creates threats to competitors if they try to challenge the company. Even Banglalion has more product variation than QUBEE has. So, they should offer more product packages with variable features. v QUBEE should come up with TV advertisement as early as possible because as they are launching new product in present market so their prime function to create consumers. Here Television media has no alternatives. They may provide expert opinion (IT engineer) or celebrity’s opinion through their advertisement. And of course they need to highlight the various uses and benefits of using wireless broadband services. v QUBEE should highlight about country of origin (they bought modem from GERMAN) while promoting product, because Bangladeshi consumers has strong faith over foreign product. It will help QUBEE to have a lime light over their product price and quality as well. v QUBEE should consider pricing of their product. Bangladesh has price sensitive market. At present consequence, it has seen QUBEE has high price. If QUBEE wants to continue with this price they should focus over their quality service and promote their product on this basic. v QUBEE should offer some discount for existing users to create brand loyalty. Like: discount over uses. v QUBEE should more concentrate on CSR activities. At present they are not doing CSR activities. To build up their brand loyalty and customers they should come up with some CSR activities. QUBEE is a new and exciting company in Bangladesh. Internet and telecommunication technologies are one of the great innovations in 21st century. This innovation has a big role in the changing mode of business environment and advertisement technology. Aamra networks are the local partner of QUBEE in Bangladesh. 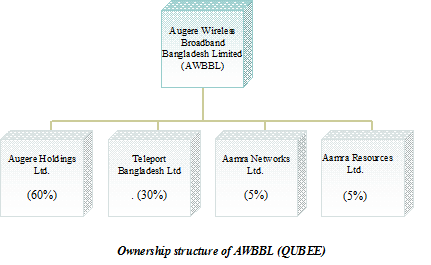 QUBEE, the foreign partner of Aamra networks who brought WiMAX for the first time in Bangladesh. During this period, I learned a lot about QUBEE and its sales operation and Strategy. In this report, I tried to describe the operation and function of QUBEE’s different sales channel. They have plans to roll out as much network coverage as possible across Bangladesh to capture the growing market by offering quality customer care and reliable services. Qubee will soon be available right across Bangladesh; the service is currently available in Dhaka and Chittagong. QUBEE believes that everyone should be able to enjoy trouble-free access to the internet and the world of opportunities that it brings. The company’s aim is to make a magical internet experience available to everyone, every day, without exception. So the company gathered a highly talented team right here in Bangladesh to build a company that’s determined to improve the internet experience for millions of people – not just here, but ultimately all over the world.